Agricultural development is the base of our nation. A recent estimate states that around 75 lakh farmers stay and operate in Telangana. Thus, it is the responsibility of the state government to come up with developmental programs for the betterment of these farmers. 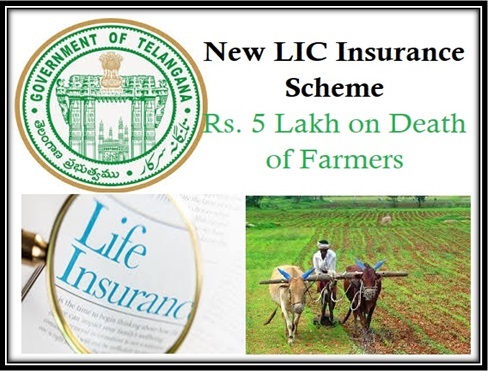 So, the state authority introduced a new life insurance scheme for the farmers. The agricultural workers need not pay anything for this policy. Development of farmers – The main aim of the state, behind the implementation of this scheme is to safeguard the lives and families of poor farmers. LIC policy – The insurance policy will be given by LIC. The state will have a tie up with this insurance company to offer these policies. Policy coverage – It has been mentioned in the scheme that the family of registered farmers will be able to get 5 lakhs from the state government. The amount will be payable in case the enrolled farmers passed away. Number of beneficiaries – As estimated by the state government, the government will offer this special insurance policy to as many as 58 lakh agricultural workers, positioned in the state. State will pay the premium – To get any life insurance policy, the person needs to pay an annual premium. In this case, the state government will take the responsibility of paying the insurance premium on behalf of all enrolled farmers. Extension of Rythu Bandhu System – It was also mentioned that all agricultural workers, who have been enrolled under the Rythu Bandhu Scheme will be able to opt for this insurance scheme as well. Residents of state – As the scheme has been introduced by the state government of Telangana, it is obvious that only those agricultural labors, which have legal residential papers of the state will get the benefits. Owner of land – It has been mentioned in the scheme that only those farmers will be able to get the insurance policy who own the agricultural land. In case the farmers grow crops on rental land, then they will not receive the benefit. The scheme has been announced recently. The state government will soon release the official notification of the scheme. The state may offer online as well as offline application procedure. As the state government aims to provide life insurance policy to a high percentage of farmers, it will require a huge amount of funds. To ensure that the implementation of the scheme happens smoothly, CM has made a budgetary allocation of Rs. 500 crore. Each year, this sum will be paid by the state government. If the state government does not do its part in safeguarding the farmers, then the poor agricultural workers will not be able to survive. Apart from agricultural scheme, sponsored by Telangana state, the authority will now offer safety to the lives of these farmers as well. In case the farmers pass away, their families will not have to worry about financial constraints. Several farmer developmental schemes are already active in Telangana. But state secretary S K Joshi addressed the press on the 24th of July, announcing the success of the recently launched insurance scheme that has been targeted towards farmers. Till date, more than 26 lakh agricultural labors have registered under this project. Many other farmers have also been contacted for registration under this particular program. With this scheme, state government will be able to safeguard the investment of farmers. In case anything happens to the insured farmer, the policy amount will be offered to his family members. Under the Rythu Bima, Telangana state government has promised to offer 5 lakhs as insurance to the poor farmers to the betterment of the farming conditions. On the day of the declaration of the news, the happy occasion has been saddened by a mishap when two agricultural workers died on the same day. As a result of this incident, LIC officials have given money to the insured framers within 24 hours of the mishap. In addition to this, the LIC officials were also of the opinion that they would try to fix the settlement of the claims within 24 hours. Once the arrangements have been made, it would help to send the money to the insured family’s account once they submit the essential papers pertaining to the claim. It would help to transfer the money to the deceased person within 10 days of the incident such that the family can be helped and saved from the amount given. With the death of the insured farmer, it is the responsibility of the family to collect the death certificate, insurance papers along with the claimed insurance money. The insurance papers need to be submitted to the LIC office to avail the benefits of the insurance. After the submission of the documents to the LIC office, the officer would check the documents with the help of electronic platforms and settle claims at the earliest. In the coming years, it has been planned that the entire procedure of claim settlement would be forwarded via the digitalized process for rapid response in the same. in the eligibility of the scheme the govt of telangana not mentioned any message about the age so you can apply for the insurance.